On Feb. 6, 2013, Soyuz lifted off from Baikonur Cosmodrome on the fourth and final Arianespace/Starsem mission currently contracted by Globalstar for the deployment of its second-generation satellite constellation. PARIS — Six Globalstar mobile communications satellites were successfully placed into low-Earth orbit Feb. 6 by a Russian Soyuz-Fregat rocket, bringing Globalstar’s second-generation constellation to 24 spacecraft and permitting the company to approach full operational status after six years of degraded service, Globalstar and launch services provider Arianespace said. Covington, La.-based Globalstar said all six satellites were healthy in orbit. Operating from Russia’s Baikonur Cosmodrome in Kazakhstan, the Soyuz vehicle, fitted with a Fregat restartable upper stage, inserted the six 650-kilogram satellites into their intended 920-kilometer orbit. Once all 24 second-generation satellites are operating with six first-generation spacecraft that were launched later than the others, Globalstar will be able to restore its two-way voice service. Performance of the first-generation constellation began to degrade in 2007 and ultimately forced Globalstar to all but abandon voice service, which it calls Duplex, in favor of less-profitable data services. The degradation is believed to have been caused by radiation in the satellites’ operating orbit. In recent months, as the second-generation satellites were placed into their operating positions, Globalstar said more and more customers were reporting success in making voice calls. The company said the six final second-generation satellites will be in service by this summer, and that the first two will be operational by March. “We fully expect Duplex service to be restored to the high level of quality that Globalstar customers historically enjoyed,” Globalstar Chief Executive Jay Monroe said in a statement. Monroe and his family’s Thermo group of companies financed a large portion of Globalstar’s second-generation effort, with help from the French export-credit agency, Coface. Globalstar’s second-generation satellites were manufactured by Thales Alenia Space of France and Italy. Globalstar and Thales Alenia Space are still negotiating terms for a final batch of six satellites. The spacecraft, with reinforced radiation protection, are designed to operate for 15 years, about double the contractual life of the first generation. 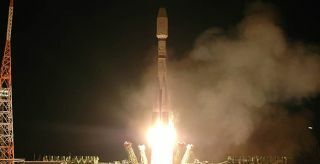 The Evry, France-based Arianespace consortium, with its Russian-French Starsem affiliate, was the launch service provider.